Every time E(ba) is true, so is E(ab), as the Chart 2.1 shows. This implication is valid only by conversion per accidens, from "All" to "Some". Chart 2.1 shows: I(ab) is true every time A(ab) is true. Then by conversion, I(ab) < I(ba) is valid. To form the obverse of a proposition, change the quality of the proposition and replace the predicate by its complement. For example, the obverse of "All believers are saved" is "No believers are non-saved." A term and its complement are said to exhaust the universe of objects. Thus, if "S" stands for the class Saved, "S' " (read: S-prime or non-S) stands for the complement class, non-Saved. The combined classes SS' totally exhaust the universe of entities, since everything in the universe must fall either into one class or its complement class. Each of the four forms has an obverse. 8. A(ab) logically implies E(ab'), the obverse. In other words, All a is b logically implies No a is non-b. Thus, if All men are sinners, then No men are non-sinners. 9. E(ab) logically implies A(ab'), the obverse. Or, No a is b logically implies All a is non-b. If No atheists are Christian, then All atheists are non-Christian. 10. I(ab) logically implies O(ab'), the obverse. Rephrasing: Some a is b logically implies Some a is not non-b. Thus, if Some men are efficient, then Some men are not inefficient (non-efficient). 11. O(ab) logically implies I(ab'), the obverse. Rewording: Some a is not b logically implies Some a is non-b. Thus, if some things are not excusable, then some things are inexcusable (non-excusable). The contrapositive of a proposition is one in which the complement terms of the subject and predicate are interchanged. Contraposition can be thought as first obverting the original, converting the resulting proposition, then obverting the resultant one. For example, the proposition "All humans are mortal" obverts to "No humans are immortal (non-mortal)" which converts to "No non-mortal persons are human" which when obverted yields "All non-mortals are non-human." 12. A(ab) logically implies A(b'a'), the contrapositive. Reread the example as shown above. Note: the contrapositive of A(b'a') is A(ab). 13. E(ab) logically implies O(b'a'), the contrapositive. The obverse of an E form yields an A form which when converted yields an I form. Obverting this I form results in the contrapositive O form. Example: If "No ungraciousness is excusable behavior," then it follows that "Some inexcusable behavior is not gracious." Step by step process is shown below. Step 1: Obversion: "All ungraciousness is inexcusable." Step 2: Conversion by Limitation: "Some inexcusable behavior is ungracious." Step 3: Obversion: "Some inexcusable behavior is not gracious." 14. O(ab) logically implies O(b'a'), the contrapositive. Some a is not b logically implies Some non-b is not non-a. Consider: Some pleasant things are not worthy. Does this mean that some unworthy things are not unpleasant? The chart below summarizes all three immediate inferences. Remember, the symbol for prime is “ ' “ attached to a letter indicates the complement of the term. In Chart 2.4, each of the immediate inferences has the original in the "Form" column. Two previous examples are cited below for review: one for obversion, the other for contraposition. A(ab) < E(ab'), is a valid logical implication. The conclusion is obtained by obverting the premise, A(ab) in this manner: change the quality of the premise and replace its predicate (b) by its complement, (b'). While the formulation of immediate inferences as logical implications using the "<" and " ' " as required, and applying Chart 2.1 features to determine validity, this procedure becomes more complicated and tiresome for obversion and contraposition. For these reasons, we have evaluated these immediate inferences using definitions. Nevertheless, all of the immediate inferences can be tested using Chart 2.1. 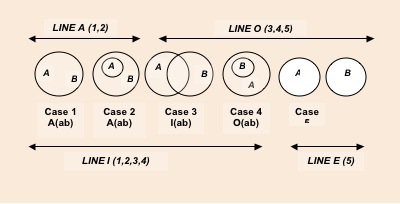 Should the student be inclined to carry out these procedures, it should be noted that for each case, everything outside of circle a is a'; everything outside of circle b is b', and vice versa. These additional notations must be filled in the 5 Cases of circles correctly for accurate results.